I know I'm late to the party on this one, but my family has just moved houses and I've been going through midterms so trying to get my package has been difficult. 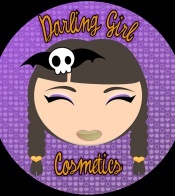 I didn't get a chance to do lip swatches but Darling Girl's Halloween collection Darling Ghoul is one of the best Halloween releases of the year. I'm really happy with my order and wish I had gotten more. Though the shop is closed right now, Susan will have it back up after Halloween for a week before the limited edition collection will be taken down. A little bit about the products. Spectral Shifts are duochrome highlighters/eyeshadows/blushes in one. They can pretty much be used in any fashion you like and are completely awesome. The Sweet Cheeks Cream Blush is also multi-use in that it can also be used as a lip tint. In addition to this, I got quite a few shades from the core line so I'll make note of that when I come to a swatch of those. First up is the lippie items. L-R: Sheered layer of Ghouls Gone Wild Lip Jelly, Layered Just Bitten Cream Blush, Single layer Just Bitten Cream Blush, Layered Posion Plum Kiss You Off lip balm, Single layer Poison Plum lip balm. I was really impressed by the lip products I got from Darling Girl. My favourite has to be Poison Plum Kiss Me Off Lip Balm though. The colour is absolutely stunning for fall and I think it really suits all skin tones. A dark berry with a ton of gold and violet sparkle. The packaging is slim and easy to use, plus the label is waterproof, though it does overlap slightly. The balm itself is moisturizing and balmy in texture, but not so much that it slides around. It has a buildable texture so you can apply sheerly for a tint for layered for a lovely darker lip. I absolutely love it. Poison Plum costs $4.75 USD. Ghouls Gone Wild is very pretty but much more subtle than I was hoping. Certainly it is full of holographic glitter which is non-gritty but I was personally hoping it would impart more of a green tint when applied than it does. When you look at it in the pot, it has this amazing light green irredesence but this doesn't transfer to the lips, it really goes on clear. I also wasn't crazy about the pot, as though it was full I had to be really careful when opening it as the whipped texture had a tendency to drag and get outside the pot edge. It does feel nice on though, slightly moisturizing and non-sticky. Doesn't last too long however is better than some glosses I have. It will make a nice layering product. Ghouls Gone Wild Lip Jelly costs $4.25 USD. Going Batty Holo Gloss at first looks scary and unwearable but is the exact opposite in reality. It's absolutely stunning and I wish I bought the full size product instead of just a sample. It's a dark-medium brown based gloss with holographic, orange, pink and green sparkle. On the lips it goes a pretty pink-brown with fantastic sparkle. I've never seen anything even remotely like it. It has a slightly stiffer texture than Ghouls Gone Wild but feels very similar on. Gloss-like with no stickiness and slightly moisturizing. It has decent wear-time for a non-sticky gloss too. I think it looks great on it's own and would be a nice addition over lipsticks in berry and wine shades too. The holo glosses cost $4.50 USD. The Sweet Lips On The Go Sugar'd Up Lip Scrub is a wonderful product too. It is a sugar scrub that you can choose the flavour of out of 36 different flavours (that's a HUGE amount!). I chose Amaretto (my favourite alcoholic drink. I particularly love it mixed with strawberry daiquiri instead of rum. Yummy! ), and I am SO glad I did. This smells amazing and exactly like Amaretto does (a sort of almond-cherry for those of you who haven't tried the drink). Plus it tastes awesome too, lovely and sweet without being overpowering. A bit tough to get the hang of, you only need the smallest amount of scrub from the top of the overpacked spin-up tube to sufficiently scrub dry patches from your lips. When you're done you can sort of rub/wash/lick away the excess. *guilty of licking* It doesn't leave much of a residue, though I kind of wish it did. Though I found my lips very soft and smooth afterwards, I did feel that I needed a balm after to really finish treating my lips as they felt a bit battered. This may be because I used a bit much on my first go though (I'm still experimenting with perfecting exactly the right amount to use- you need so little it's hard to estimate at first.) Overall, this is the best lip scrub product at the most decent price I've found to date. Most of the bigger brand companies only offer lip scrubs at exorbitant prices in pots. I love not having to dip my finger in a pot then transferring it to my lips afterwards. This lip scrub costs $5.50 USD. Just Bitten Sweet Cheeks Cream Blush was originally made as a dupe for the Tarte for True Blood Cheek Stain, and I have to say I like the texture of this one even more! Though slightly expensive for the size at $6.50 USD you need so little of this product to get the needed amount for your cheeks it will take you quite an amount of time to get through the pot. It's a beautiful red flush with a very subtle and spread-out gold shimmer (you can only sometimes barely see it). I do wish the gold showed up a bit more personally but others who complained about the Tarte True Blood one having too much gold shimmer will like and appreciate this one. This product spreads well and sinks in super quick. Despite some of the main ingredients being oils they aren't bad for your skin oils but instead ones that are good for it instead- meaning it won't break you out. I love the flush this gives and it makes me want to try out other shades from the Sweet Cheeks range. I'm not too sure I like the pot, just because I find it kind of deep so as I go through it I can see having to angle my finger weird to get product out and I don't like grooves near my blush/gel products because I'm spoiled and messy and am likely to eventually get product stuck in the threads. I tried to get these as colour accurate as possible but some of them are off or only showing one part of the duochrome effect. I tried but I wasn't as successful as I'd hoped to be. All the eyeshadows and spectral shifts came with sticker-sealed shifter tops on them. The spectral shifts are lovely products. Well pigmented and slightly washed out shades they have awesome duochrome to them. I LOVE Corpse Candle and Ghost Light- both are truly unique and pretty. Corpse Candle is a light grey with lavender duochrome. Ghost Light is a washed-out teal/medium blue with lighter blue duochrome. Exactly what a ghost-light I think would look like. The shade is really other-worldly and ethereal. It's not as bright as the pictures show it to be in real life. Will-o-Wisp is a slightly coral pink shade with slight blue reflect. Another really unique shade though I'm not quite sure how it will look as a blush I'm highly tempted to try it as such. Pumpkin Eater is a bright orange metallic shade with really small green glitter. I was a bit disappointed with this one as I was hoping for a more obvious/denser green sparkle as it is really subtle. It is a very pretty shade though. Jack's Lantern was the last of the Halloween eyeshadows I got. It is a black-plum shade with a medium/dark purple/burgundy highlight. It's supposed to represent the glowing cut out portions of a Jack-o-Lantern. I think the colour idea is a great one and I get the feeling of the inspiration from it but personally find it a bit too black/charcoal-like. I had to layer it quite heavily to get the burgundy/aubergine aspects to really show up. Monarch eyeshadow was the Gift with Purchase for the week that I purchased my order from. It's a reddened brown with super-sparkly blue/green shimmer. It's reminiscent of Mac Club though not as duochromy or dark as that and less green. It also reminds me a bit of Fyrinnae's Sumatran Tiger eyeshadow. It's a nice shade that was prettier than expected because of it's uber shimmer but one I don't think I'll use too often. Whimsy is a light grey shade with a light green duochrome. Very pretty and subtle but an interesting everyday shade. It was well pigmented too. New Grass was a free sample from my purchase. It's a bright grass green with an interesting but subtle purple/red glitter. Not obvious enough to make it look christmasy or strange but unique for sure. Incognito was my other free sample with purchase. A bright reddened purple shimmer. It's very rich and pigmented. Everything's Rosy Blush is a yellow based medium pink with very faint gold in it. It is very pigmented so you'd have to go extremely light when applying this but it is a nice shade. Not too unique but pretty. Darling Girl has a slightly long TAT (Turn Around Time) of about 14-16 buisness days but everything is well packed and her samples are generous. Plus I got little goodies with my order (a package of Candy Corn a Darling Girl Sticker and two Halloween rings which was cute). The variety of product sizes was great (most things have a sample size, a small size and a large size). The prices are also reasonable and the shipping is low. Plus Susan the owner is an absolute sweetheart to speak to in person or over facebook. Plus she keeps a blog that regularly updates with information about what is happening in her life, what is going on at Darling Girl and upcoming products. The most popular products from the Darling Ghoul collection are Poison Plum Lip Balm, Ghost Light Spectral Shift, Bats in the Belfry eyeshadow and Jack's Lantern eyeshadow, if you want a starting point at what to look for! Would I buy from Darling Girl Cosmetics again? Yes! I'd love to try more of their products. This company is so unique and the quality is really there. Not to mention the sheer variety of products!